Apple today updated MacBook Pro with Retina display with fourth generation Intel Core processors, the latest graphics, longer battery life, faster flash storage and next generation Wi-Fi. Starting at a new lower price of $1,299 (US), the updated MacBook Pro with Retina display features a stunning high-resolution display, an amazing thin and light design, and the latest technology to power through the most demanding projects. Apple today also announced that both iWork and iLife are now free with the purchase of every new Mac. At 0.71-inches thin, the updated MacBook Pro with Retina display delivers unbelievable performance in an incredibly portable design. The 13-inch MacBook Pro with Retina display features fourth generation dual-core Intel Core i5 processors up to 2.6 GHz with Turbo Boost speeds up to 3.1 GHz. New integrated Intel Iris graphics deliver up to 90 percent faster performance than the previous generation MacBook Pro with Retina display. * The 13-inch model can be configured with faster dual-core Intel Core i7 processors up to 2.8 GHz with Turbo Boost speeds up to 3.3 GHz. MacBook Pro with Retina display now features PCIe-based flash storage with up to 60 percent faster read speeds than the previous generation. Next generation 802.11ac Wi-Fi delivers wireless performance that is up to three times faster when connected to an 802.11ac base station. Dual Thunderbolt 2 ports deliver up to 20Gbps of bandwidth to each external device, allowing users to connect to multiple displays and high performance devices, and an HDMI port offers quick connectivity to HDTVs and projectors. 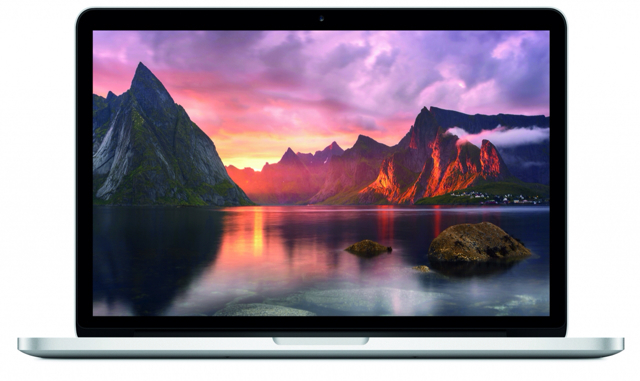 The updated MacBook Pro with Retina display ships with OS X Mavericks. Mavericks is the 10th major release of the world’s most advanced operating system and is available for free from the Mac App Store℠. In addition to more than 200 new features, Mavericks introduces core technologies designed specifically for portables to boost performance and improve the battery life of your Mac. Compressed Memory in OS X Mavericks automatically shrinks inactive data in memory to keep your Mac fast and responsive. Mavericks also delivers significant performance enhancements for systems with integrated graphics through optimized OpenCL support and dynamic video memory allocation. For more information or to download Mavericks visit www.apple.com/osx/. Apple today also announced that in addition to iLife, iWork productivity apps are now included with every new Mac purchase. iWork, which includes Pages, Numbers and Keynote, makes it easy for anyone to create, edit and share stunning documents, spreadsheets and presentations. All iLife and iWork apps have been completely redesigned to take full advantage of OS X Mavericks, have been updated to 64-bit, are integrated with iCloud and are loaded with hundreds of new features that let you do more than ever across your Apple devices. Continuing Apple’s commitment to energy efficiency and the environment, MacBook Pro with Retina display meets stringent Energy Star 6.0 requirements and achieves an EPEAT Gold rating. 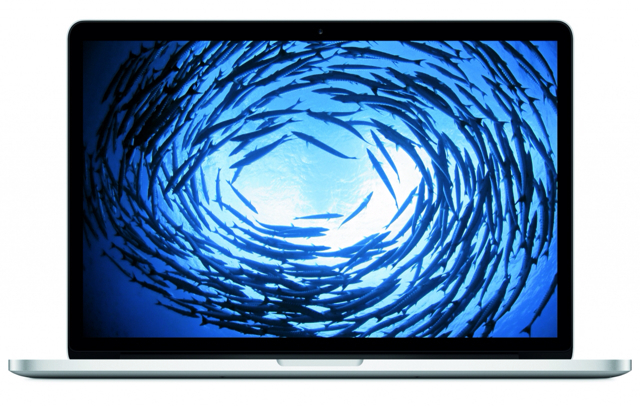 MacBook Pro with Retina display features LED-backlit displays that are mercury-free and made with arsenic-free glass. MacBook Pro with Retina display includes PVC-free components and cables, contains no brominated flame retardants, and uses highly recyclable materials and material-efficient packaging designs. MacBook Pro with Retina display is available today through the Apple Online Store (www.apple.com), Apple’s retail stores and select Apple Authorized Resellers. The 13-inch MacBook Pro is available with a 2.4 GHz dual-core Intel Core i5 processor with Turbo Boost speeds up to 2.9 GHz, 4GB of memory, 128GB of flash storage, and Intel Iris graphics starting at $1,299 (US); and with a 2.4 GHz dual-core Intel Core i5 processor with Turbo Boost speeds up to 2.9 GHz, 8GB of memory, 256GB of flash storage, and Intel Iris graphics starting at $1,499 (US); and with a 2.6 GHz dual-core Intel Core i5 processor with Turbo Boost speeds up to 3.1 GHz, 8GB of memory, 512GB of flash storage, and Intel Iris graphics starting at $1,799 (US). Configure-to-order options include faster dual-core Intel Core i7 processors up to 2.8 GHz with Turbo Boost speeds up to 3.3 GHz, up to 16GB of memory and flash storage up to 1TB. The 15-inch MacBook Pro is available with a 2.0 GHz quad-core Intel Core i7 processor with Turbo Boost speeds up to 3.2 GHz, 8GB of memory, 256GB of flash storage and Intel Iris Pro graphics starting at $1,999 (US); and with a 2.3 GHz quad-core Intel Core i7 processor with Turbo Boost speeds up to 3.5 GHz, 16GB of memory, 512GB of flash storage, and Intel Iris Pro and NVIDIA GeForce GT 750M graphics starting at $2,599 (US). Configure-to-order options include faster quad-core Intel Core i7 processors up to 2.6 GHz with Turbo Boost speeds up to 3.8 GHz, up to 16GB of memory and flash storage up to 1TB.